Every year around this time I get in some sort of funk. This year it’s a self-doubt/lack of inspiration type funk. The good news is, I recognized it almost immediately and made a plan to start tackling it. I’ve already seen an uptick in my mood and outlook, so here are my best recommendations on beating the winter blues. I’m not sure why I forget this every year, but without the sun, I’m not myself. I try to take a multivitamin all year round, but in the winter I have to be diligent about takin it every day + add a vitamin D pill. I read somewhere that vitamin D deficiency can cause insomnia so that explains a lot for me too. Needless to say, I’ve got plenty of reasons to make this one a priority and if you feel less like yourself in the winter too, I’d highly recommend it. January is a weird month. We’re coming off the holidays. It’s too cold to spend much time outside. It’s dark all the time. There aren’t a lot of social engagements on the calendar. It seems like it would be a perfect time for focusing on yourself. 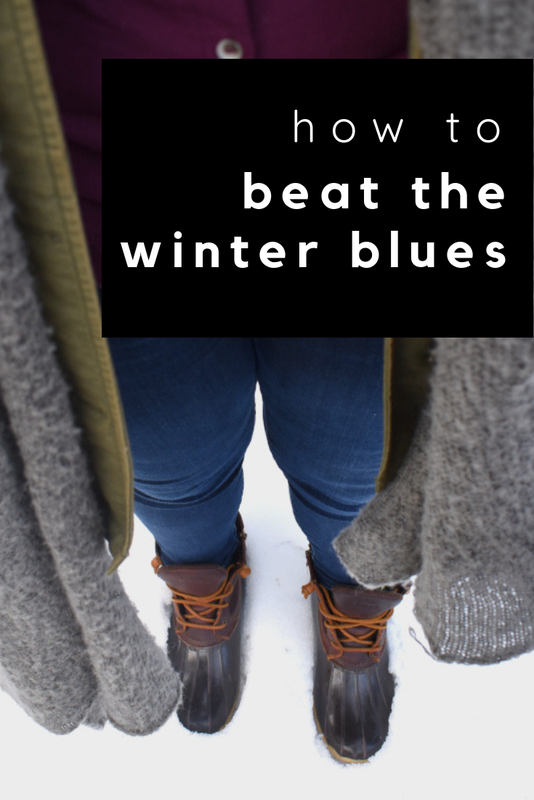 But if you fall victim to the winter blues like I do, you might just be watching a lot more TV or spending all your spare time thinking about your new year diet. Take some time to turn off all the noise and think. Write about how you’re feeling. Spend a full 24 hours alone + doing things just for you. Don’t fill your extra space with anything that’s not healthy + nourishing. It may not be what you really want to do when there’s so much good TV happening, but I swear it helps. Do a photography challenge, organize your closets, make a piece of art, declutter your house, make a January bucket list – all these things clear space in your brain and get the creative juices flowing. And there’s just something about tackling something that gets your momentum going which helps turn your mood around. Staying home begets more staying home. I know this because I work at home which means I can’t be bothered to go down the street to the grocery store for anything less than a 10 item list. It’s just a lot easier to stay where you are, but it’s not great for your mental health. Take a walk. Drive to the gas station and get yourself a coke. Go out for drinks. Drive around in your pajamas. Seriously, just getting out almost always makes it easier to do other things too. For all of the reasons I’ve already mentioned, January isn’t a time that a lot of people are making a lot of plans, but that doesn’t mean you can’t. Schedule a dinner, invite people over for a movie night, go to gym with a friend. Try for something social at least once a week. Or if you’re able, schedule a trip somewhere warm. This has saved me the past few winters. If you can’t travel, plan a staycation. Having something planned (especially something warm) will give you something to fun to look forward to. I try to make this something quick + manageable. Earlier in the day will help you start out on the right foot. Watch an inspiring YouTube clip (maybe Tony Robbins, Brene Brown, or Abraham Hicks), walk outside in the fresh air, or dance it out. I recommend dancing it out, especially to the Trolls soundtrack (if you haven’t watched Trolls, that definitely counts as something uplifting), because it gives you immediate physical momentum + moves your body in a quick, fun way.